Waiting Is Not Easy! In this fun story, Piggie has a surprise for Gerald, but he is going to have to wait for it. And Wait. And wait some more. This is very hard for Gerald. He at first is so excited that he can not wait. He begins asking Piggie lots of questions. When Piggie still won’t tell him he tries to wait but it is getting harder. He goes through the emotions of frustration and worry that the surprise will never come. The pictures capture these emotions which allow for students to better grasp feelings. At the end, Gerald is glad he waited. 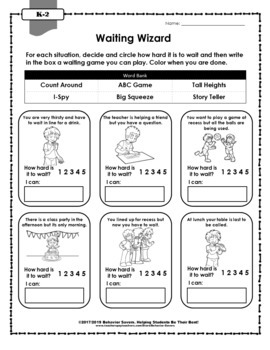 This resource includes a 30 minute lesson plan and activities which is a perfect way to introduce stories during circle time, social emotional learning time, or even as a sub plan when you want to reinforce concepts already talked about. It is also designed to follow the concepts presented in the Second Step® Curriculum. This product has been granted permission from the publisher and is meant to align with the materials of the Second Step® curriculum. 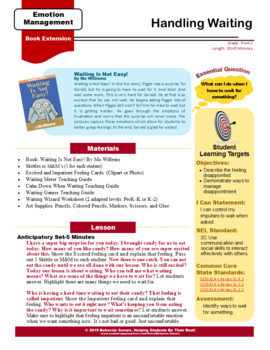 It is also perfect for social workers, counselors, or psychologists to reteach the Second Step® Curriculum concepts in small groups or individual sessions. 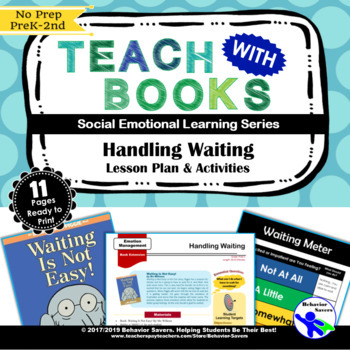 It comes complete with a scripted lesson plan, connections to social emotional/common core standards, lesson teaching guides, and individual practice pages.